Common beans are widely utilized as a food source, yet are low in the essential amino acid methionine. 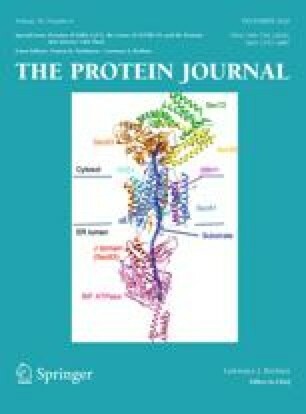 As an initial step to overcome this defect the methionine content of the primary bean seed storage protein phaseolin was increased by replacing 20 evolutionarily variant hydrophobic residues with methionine and inserting short, methionine-rich sequences into turn and loop regions of the protein structure. Methionine enhancement ranged from 5 to 30 residues. AnEscherichia coli expression system was developed to characterize the structural stability of the mutant proteins. Proteins of expected sizes were obtained for all constructs except for negative controls, which were rapidly degraded inE. coli. Thermal denaturation of the purified proteins demonstrated that both wild-type and mutant phaseolin proteins denatured reversibly at approximately 61°C. In addition, urea denaturation experiments of the wild-type and a mutant protein (with 30 additional methionines) confirmed that the structural stability of the proteins was very similar. Remarkably, these results indicate that the phaseolin protein tolerates extensive modifications, including 20 substitutions and two loop inserts for methionine enhancement in theβ-barrel and loop structures, with extremely small effects on protein stability.